The Empty Nesters: He's She's Making A List...He's She's Checking It Twice!! 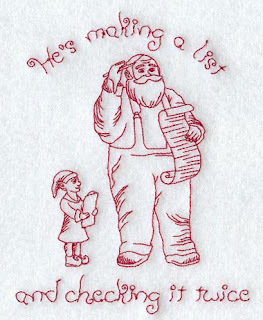 He's She's Making A List...He's She's Checking It Twice!! Making a list...checking it twice!! Ok, I admit it, I am a self proclaimed list maker. Just ask the hubby. It drives him CRAZY at times!! But being a working Mother of two teens, you have to try anything and everything to stay organized. And notice the emphasis on try!! So it is only natural that I have a been making my own list and that I have been checking them twice. But I think I can cross most of the items off...or at least I hope!! MAIL CHRISTMAS CARDS Yeah, don't ask!! I'm a list maker too. I get it from my mom, she makes lists for everything!